Oral Hypoglycemics Overdose is the accidental or intentional intake of the medications in dosage higher than prescribed values. What is Oral Hypoglycemics Overdose? What are the Causes of Oral Hypoglycemics Overdose? What are the Signs and Symptoms of Oral Hypoglycemics Overdose? The signs and symptoms of Oral Hypoglycemics Overdose can vary from one individual to another. It may be mild in some and severe in others. Several systems of the body may be affected. How is First Aid administered for Oral Hypoglycemics Overdose? Who should administer First Aid for Oral Hypoglycemics Overdose? 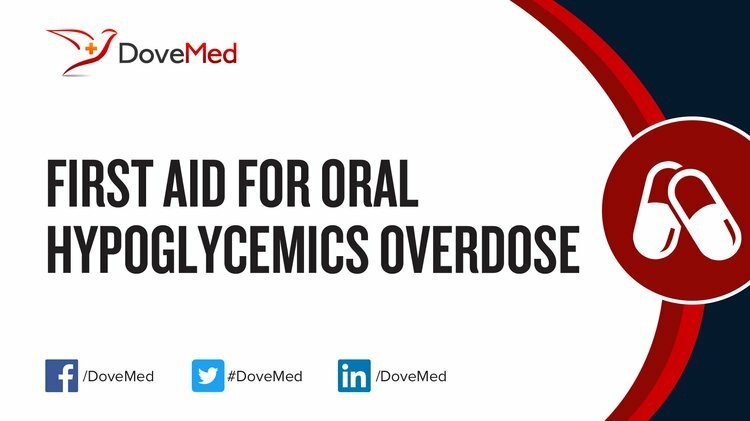 First aid for Oral Hypoglycemics Overdose is administered by healthcare professionals. What is the Prognosis of Oral Hypoglycemics Overdose? How can Oral Hypoglycemics Overdose be Prevented? Furukawa, S., Kumagi, T., Miyake, T., Ueda, T., Niiya, T., Nishino, K., ... & Onji, M. (2012). Suicide attempt by an overdose of sitagliptin, an oral hypoglycemic agent: a case report and a review of the literature. Endocrine journal, 59(4), 329-333. Dougherty, P. P., & Klein-Schwartz, W. (2010). Octreotide’s role in the management of sulfonylurea-induced hypoglycemia. Journal of Medical Toxicology, 6(2), 199-206. Lu, M., & Inboriboon, P. C. (2011). Lantus insulin overdose: A case report. The Journal of emergency medicine, 41(4), 374-377. Groth, C. M., & Banzon, E. R. (2013). Octreotide for the treatment of hypoglycemia after insulin glargine overdose. The Journal of emergency medicine, 45(2), 194-198. Svingos, R. S., Fernandez, E. M., Reeder, D. N., & Parker, J. J. (2013). Life‐Threatening Hypoglycemia Associated with Intentional Insulin Ingestion. Pharmacotherapy: The Journal of Human Pharmacology and Drug Therapy, 33(3), e28-e33. Klein‐Schwartz, W., Stassinos, G. L., & Isbister, G. K. (2016). Treatment of sulfonylurea and insulin overdose. British journal of clinical pharmacology, 81(3), 496-504. Sekhar, M. S., Mary, C. A., Anju, P. G., & Hamsa, N. A. (2011). Study on drug related hospital admissions in a tertiary care hospital in South India. Saudi Pharmaceutical Journal, 19(4), 273-278. Zanchi, A., Lehmann, R., & Philippe, J. (2012). Antidiabetic drugs and kidney disease--recommendations of the Swiss Society for Endocrinology and Diabetology. Swiss medical weekly, 142, w13629.